Friday May 14th 1897 It was colder this morning. I got started to town by half past seven oclock. There was a show in town. I found Mother at Chalfants and she went with me over to Mary Woolfs for eggs. I spent part of the afternoon at home visiting with Fanny as the folks here came home from Des Moines. Saturday May 15th 1897 I set some hens this forenoon and did sweeping. In the afternoon I churned and did dusting. Aunt Lib and Mrs Gregory called. After they went home I went over to Auntys a little while. It was late when I finished work Will finished plowing 80 acres of corn in the bottom land. Sunday May 16th 1897 It was a fine daty. Ott & Fanny were down for a visit I was busy all forenoon with the work. We all went over to Johns in the afternoon. After the folks went home we did the evening work. George & John were both away for dinner. 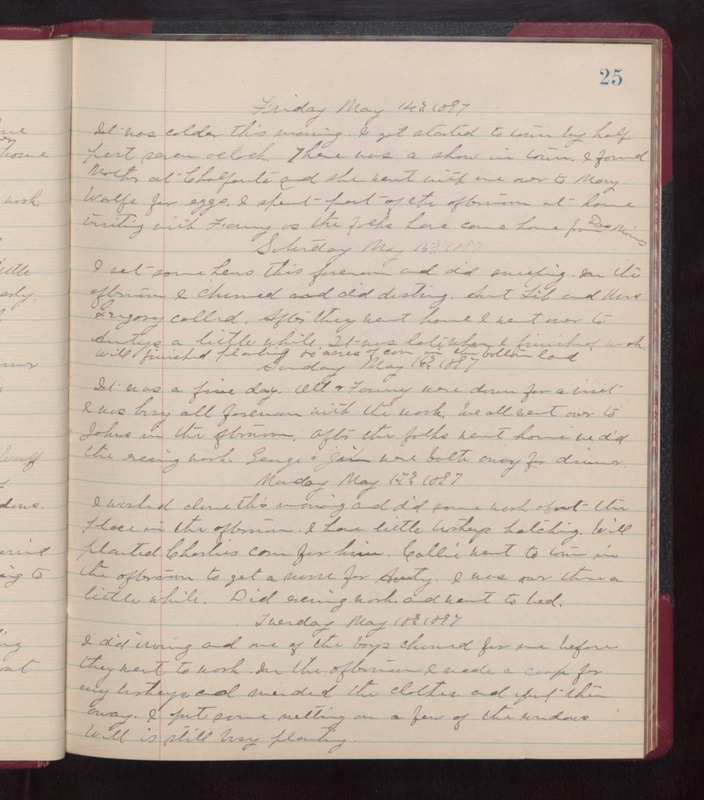 Monday May 17th 1897 I worked alone this morning and did some work about the place in the afternoon. I have little turkeys hatching. Will planted Charlies corn for him. Callie went to town in the afternoon to get a nurse for Aunty. I was over there a little while. Did evening work and went to bed. Tuesday May 18th 1897 I did ironing and one of the boys churned for me before they went to work. In the afternoon I made a coop for my turkeys and mended the clothes and put them away. I put some netting in a few of the windows. Will is till busy planting.